Page building in word press is an optional plugin that allows you to edit headers and footers on your word press site. If you want to build a professional site this is the simplest way to go about it. Elementor is the number one word press page builder; it comes with amazing features that will enable design your website easily. There are a lot of page builders in the market today; choosing a good page builder that will give you great results can be a challenge. Elementor stands out as a professional in page building and theme building. Elementor gives you instant feedback. Unlike other design companies where you hold your mouse drag-drop and wait for what seems like an eternity, here you work on the front end once you finish the design it is already at your disposal. This will ensure you can access the optimized page and screen with any device. You do not have to go through the tiring task of dealing with developers and switching themes. With Elementor, you have the full power to design your theme. Free & Open Source: This does not limit you to the pages you need to design and build a page; it is open for you to access all the features you will need to do a good job. • Elementor has dozens of widgets to choose from, create any content you need with the buttons, forms and headlines everything is at your reach. • Their list of templates designed to fit every industry will give you a choice of about 300 items to choose from. • Editing anything on your mobile is possible, you can do this anywhere so if the eureka moment comes no matter where you are all you have to do is reach out for your mobile and do it. • Drag and drop are all you need to do to customize anything on your web. • The inline editing feature allows you to type straight on the screen, writing posts and intuitive content has never been easier. • There is no coding. The page code is optimized for every device. • Elementor has been translated into 23 languages and we do not stop there, we are working on adding more languages. • To adapt your websites to specific device sizes, change your tablet and mobile breakpoint values, and you are good to go. • Eliminator understands both LTR and RTL languages. Three plans are waiting for you. 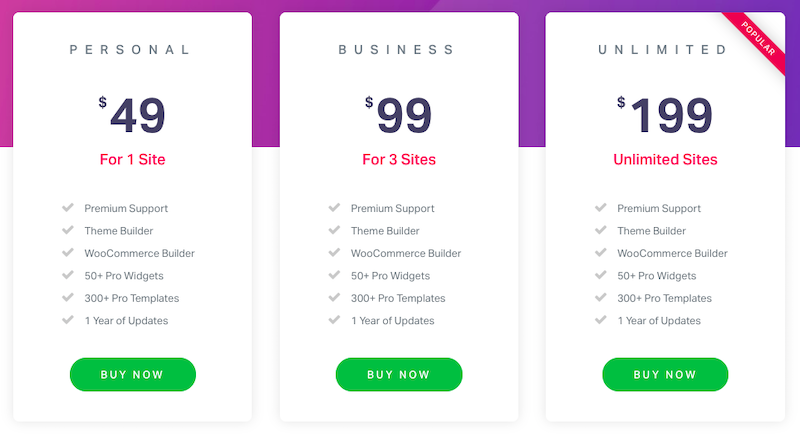 The Personal plan comes for one site with $49. The Business plan with more features available at $99. It can be used for three websites. The most popular and well appreciated Unlimited Plan worth $199. This is unlimited. And, you will get incredible offers using Elementor coupon, promo, and discount codes. Eliminator is the gateway to your beautiful websites. The features are incredible and affordable. Elementor do not give empty promises, but they deliver. Elementor also give you support on how to use our product by offering video tutorials, in-depth articles that help you learn how to create amazing websites step by step and with our all round the clock support nothing will go wrong.